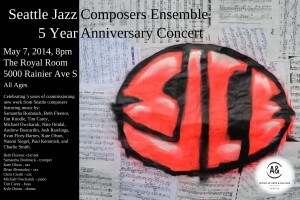 be a reading of new tunes by SJCE contributing composers. Wed. 5/7/14, 8pm at The Royal Room. All ages, Pay what you can. Featuring music by: Samantha Boshnack, Beth Fleenor, Kate Olson, Michael Owcharuk, Josh Rawlings, Jim Knodle, Tim Carey, Evan Flory-Barnes, Charlie Smith, Naomi Siegel, Paul Kemmish, and more. The band: Beth Fleenor (clarinet); Samantha Boshnack (trumpet), Kate Olson, Brian Bermudez, Chris Credit (woodwinds); Michael Owcharuk (piano), Tim Carey(bass), and Kyle Doran (drums). Made possible by the Seattle Office of Arts and Culture’s Civic Partners program. This entry was posted in Next Up!, Uncategorized on April 24, 2014 by owcharuk. Music inspired by Molly Wizenberg’s cook book A Homemade Life. Molly Wizenberg will be on hand then talking about the book. 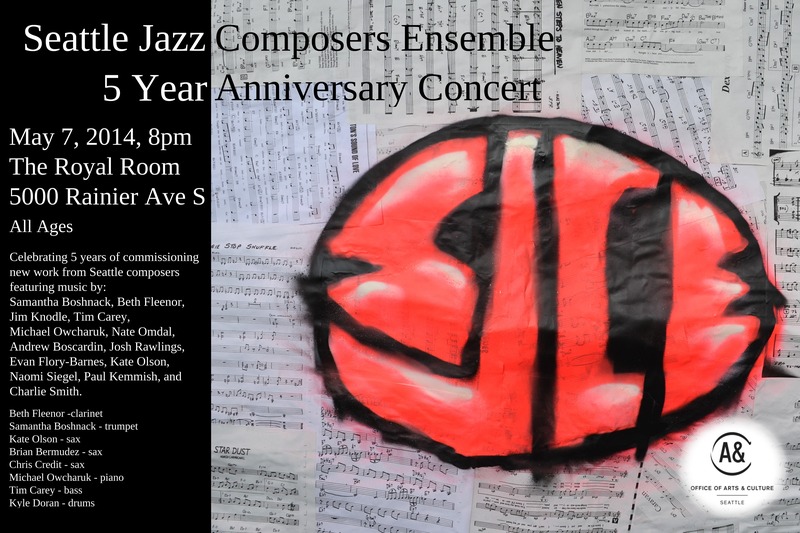 Featuring music by Fredd Luongo, Emmett Montgomery, Nancy K Dillon, Aaron Starkey , Tekla Waterfield, Shawnmarie Stanton, Nick Foster, Sam Russell, Amanda Sue Winterhalter, Debbie Miller, Mike Votava and Sundae + Jason Goesel. Comedian Emmett Montgomery will be presenting his amazing brand of storytelling. This entry was posted in Next Up!, Uncategorized on April 21, 2014 by owcharuk.